PRO-LOK AK42-MEGA Mega Long Reach Kit (AK42-MEGA) FREE SHIPPING! Look to the PRO-LOK AK42-MEGA Long Reach Kit for a versatile car opening kit. This 12-piece kit includes everything needed to gain entry into a vehicle while protecting windows and paint finishes. 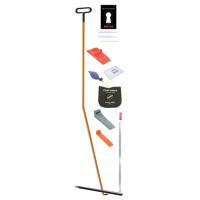 Gain entrance with tools like an inflatable pump wedge that inserts at the top of a door frame, or a hand pump to create space without marring the vehicle. Pliable rubber wedges support and protect openings and a double-sided wedge comes in two heights for different door types. For locks, the kit includes easy to use tools, like the original Slim Jim which slides in between weather stripping and windows to manipulate locking mechanisms. To access lift-lock buttons, there's the lock lifter tool and the 58" long reach tool reaches keys left inside the car. The pick start kit comes with two different lock picks, a tension wrench and an eight page instructional booklet with convenient cut-away instructions. From rookies to seasoned veterans, the adaptable PRO-LOK Mega car opening kit is the answer to gaining entry to most vehicles on the road today. ©2002-2019 CopsPlus.com: PRO-LOK AK42-MEGA Mega Long Reach Kit (AK42-MEGA) FREE SHIPPING!